This post may contain affiliate links. By clicking and purchasing products through my links, I receive a commission at no cost to you. This helps me continue creating more helpful content like this. Thanks for your support! 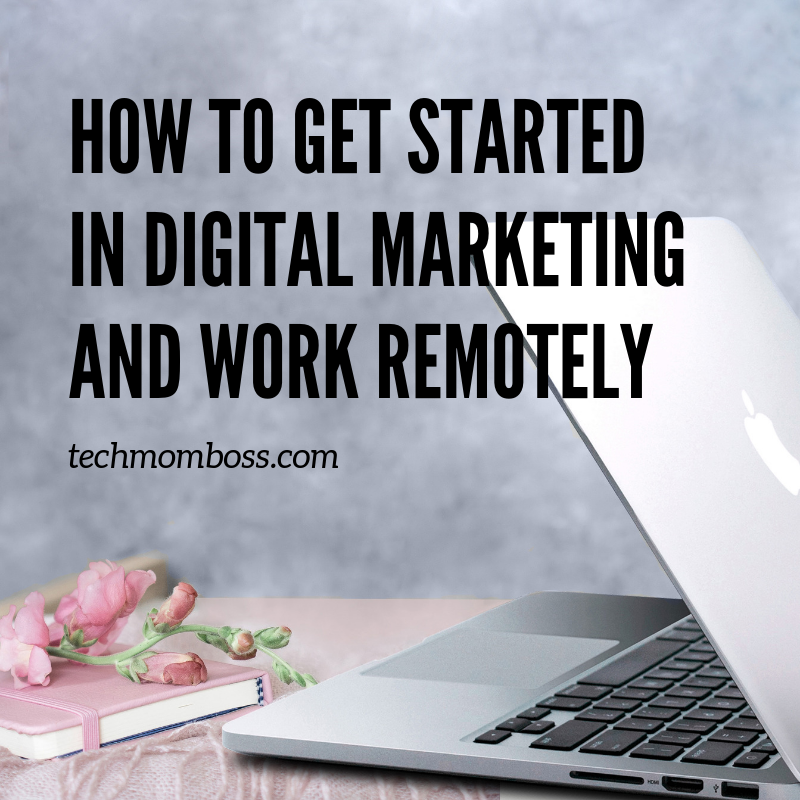 I work in digital marketing and have been working 100% remote from my home office for over 10 years now. I was talking to a friend who was interested in finding jobs where she could work from home too. She wanted to learn more about digital marketing so she could get skills in an area she was seeing a lot of remote work opportunities. She wanted a basic check list of areas where she can do some research and learn more. Are you interested in changing careers? Are you interested in doing digital marketing and don’t know where to start? Learning about the following topics is a good start to help get the skills needed for a digital marketing job. Search engine optimization is all about getting traffic from free or organic search results on search engines. You should learn SEO and keep up-to-date with changes. Learn all the basics of optimizing for search. There are lots of Google courses you could take. You should also look into getting your Google Analytics certification. Search engine marketing includes paid search, pay-per-click, etc. When you are working with clients, depending on their budget and needs you will most likely be working on a combination of SEO and Paid Search. You’ll need to get an understanding of what landing pages area and what contributes to the success of paid search campaigns. Look into getting the Google Adwords certification to help you with this. Social media marketing or SMM involves creating and sharing content on social media networks like Facebook, Twitter, Instagram, etc to promote a product or service. You’ll need to get an understanding of what you want to get out of participating in social, what are your goals, who is your audience, what converts customers on social, create great content, plan out a publishing schedule, track your results and make adjustments based on what is working/not working. You’ll need to keep up with all the changes that social platforms constantly go through. Get your Facebook Blueprint certification and other social media certifications. This was my specialty in my last two jobs! Digital analytics is where you collect and analyze data for your business so you can improve your customers online experience and achieve your business goals. Digital marketing analytics includes not just website data but also data from other sources like social media, email, and search. You’ll want to get access to the analytics or reporting dashboard of your website (like Google Analytics), social networks, app, etc. Each of the social networks has their own native dashboards, or if you are using a publishing tool use the reporting related to that tool. Go through the Google Analytics Academy courses, here. They are free and will help you learn about Google’s measurement tools. Definitely learn excel. Data is often spread out in different tools or spreadsheets and you will find you need to clean up or combine data from different sources before you can do anything. I spend a lot of time prepping and cleaning up data to get it into the format I want before I can even begin analyzing it. Learn how to use Google Data Studio. It has its limitations but it’s free and for what you get I’m able to set up standard report dashboards and automate a good amount of my reporting. Check out Avinash Kaushik’s blog called Occam’s Razor. He shares a lot of great information where he covers not just tools but helps you understand what the information actually means. This is really helpful because it’s not just about the numbers but what are the actionable insights. In order to make yourself useful you’ll need to analyze the data and provide some advice on recommended next steps based on what you’re seeing. Content marketing is all about strategy and creating great content. It’s an approach where you focus on creating content that’s valuable, relevant, and consistent for your audience or customers. There are a lot of online classes where you can learn about content marketing. You could start with Lynda.com from LinkedIn and get your Hubspot Inbound Marketing Certification. There are so many different types of content. If you are going to be helping with content creation and not just the planning or strategy, I would also recommend learning about various content creation tools. I use a combination of products like Adobe Illustrator, Photoshop, Canva, and video editing apps to create my own content. Even though this is not directly related to marketing, you will most likely need to use a content management system like WordPress or Buffer to publish content. You should be familiar with how to optimize content within the CMS tool — things like adding links, adding keywords, adding the right file size for photos or videos, etc. Whew that was a lot cover. I could see how this can be overwhelming but just start one step at a time. You can do it! If you want to hear more about remote work and tips please subscribe for my latest posts!